A first-hand report from web journalists Joanne Stocker, Kenneth Lipp and Dustin Slaughter sheds light about what has happened on Staten Island. 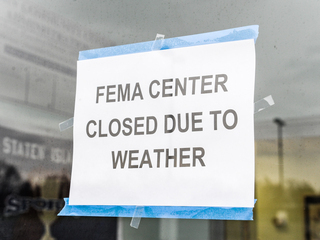 FEMA Closed Due To Weather — A sign seen taped 10:30 a.m., today, Nov. 7, at the FEMA Center at 6581 Hylan Blvd. on Staten Island. One presidential candidate thought FEMA needed major reforms and possible replacement. One thought it was just peachy. Well, you know which one won so you know what we are stuck with. The Home Improvement Consumer Protection Act of 2008 establishes a mandatory registration program for contractors who offer or perform home improvements in Pennsylvania. It establishes minimum insurance requirements for contractors; requires contractors to provide their registration number in their ads and contracts; establishes required contract terms for home improvement contracts; prohibits unfair business practices; and creates a criminal penalty for home improvement fraud. Never enter into a repair or improvement project without a written contract that includes a start and finish date and a three-day right-to-cancel notice. Never sign a blank contract, or one that does not include all the costs and supplies. Never hire a contractor who does not have a business card or local phone number and address. Never make final payment until you are completely satisfied with the work performed. Any good written contract includes the type, quality and warranty of materials to be used and outlines all the financial terms and payment schedules. It also includes a complete description of the work to be done and a guarantee that old materials and debris will be removed. For more information on hiring a good contractor and avoiding scams, visit www.attorneygeneral.gov/hiccon.aspx. 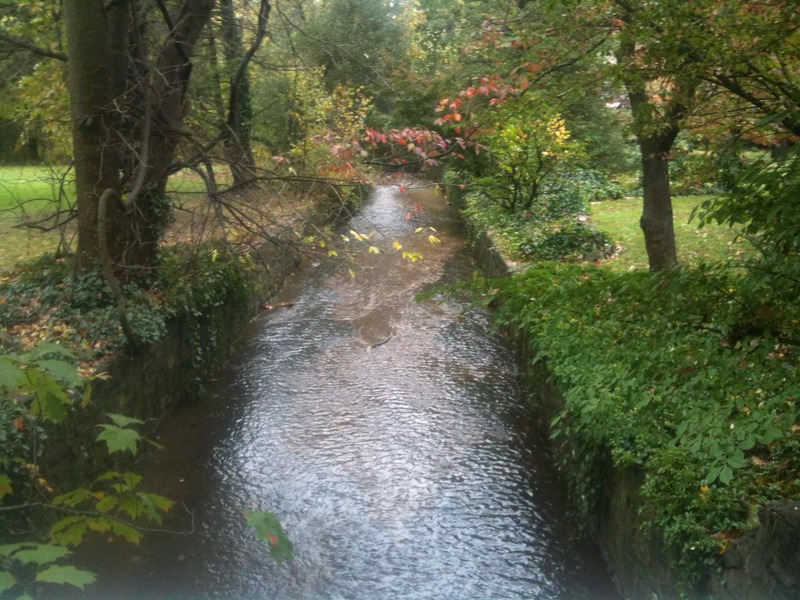 This serene shot of the creek that runs beneath North Rolling Road in Springfield Pa. was taken at 12:38 p.m., today, Oct. 29. 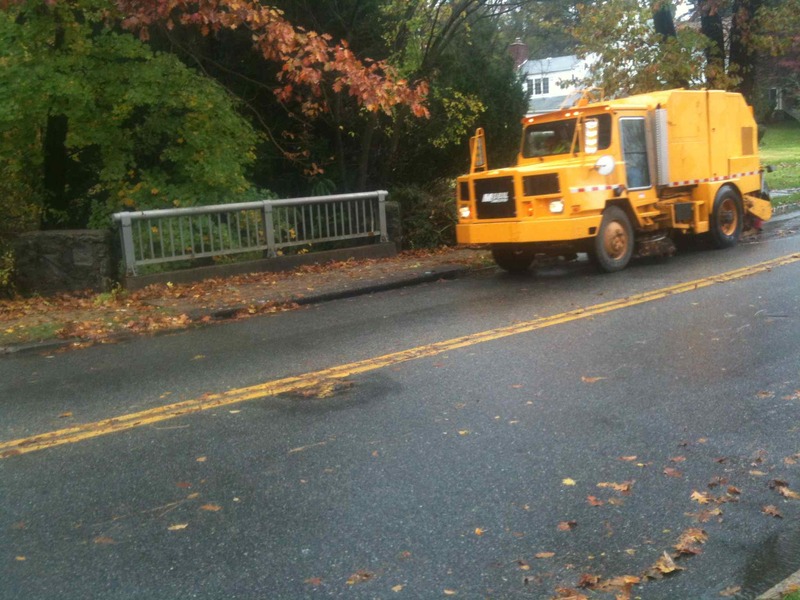 If the amount rain expected with Hurricane Sandy arrives there is a good likelihood it will flood closing the road. Springfield Township, however, is being proactive keeping leaves from clogging the drainage holes as has occurred in the past. Maybe the road will stay open. 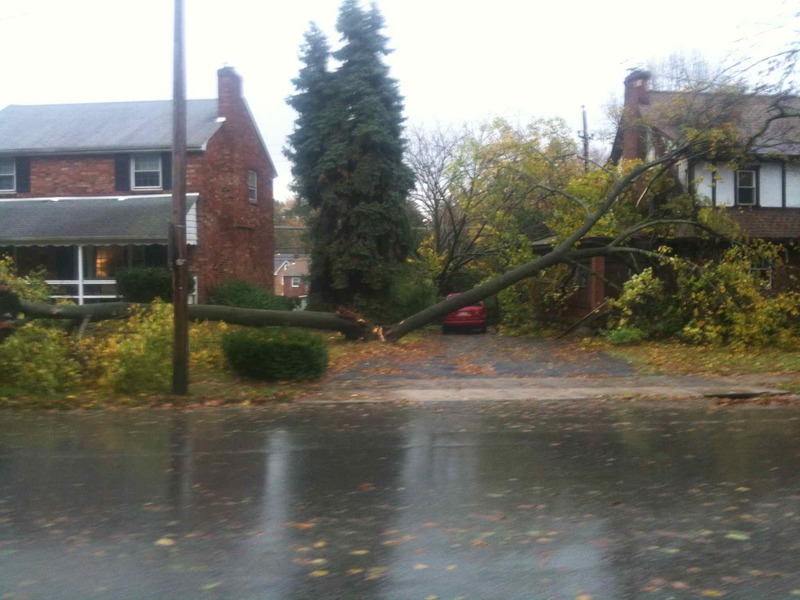 Sandy at 5:17 p.m. in Springfield, Pa — about 70 miles west of the storm’s expected 8 p.m. landfall at Atlantic City. 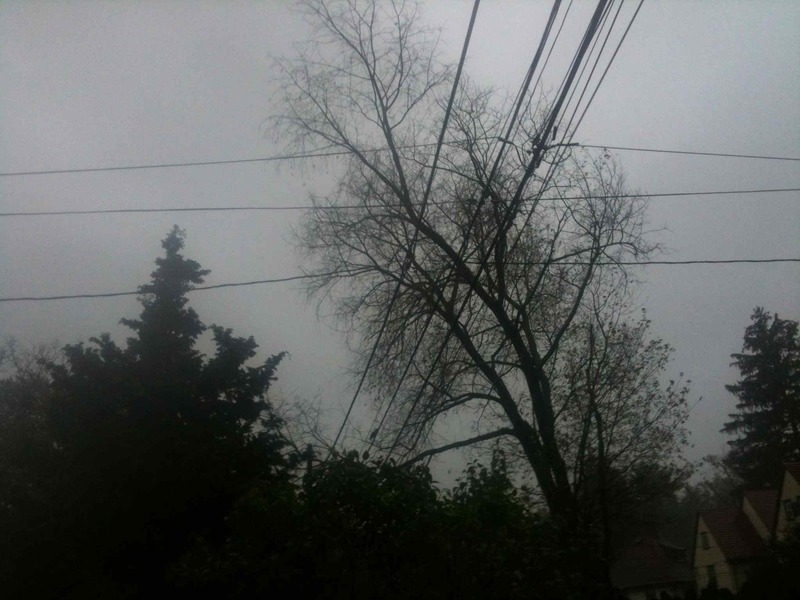 The township experienced its first power outage shortly after. It lasted less than a minute. 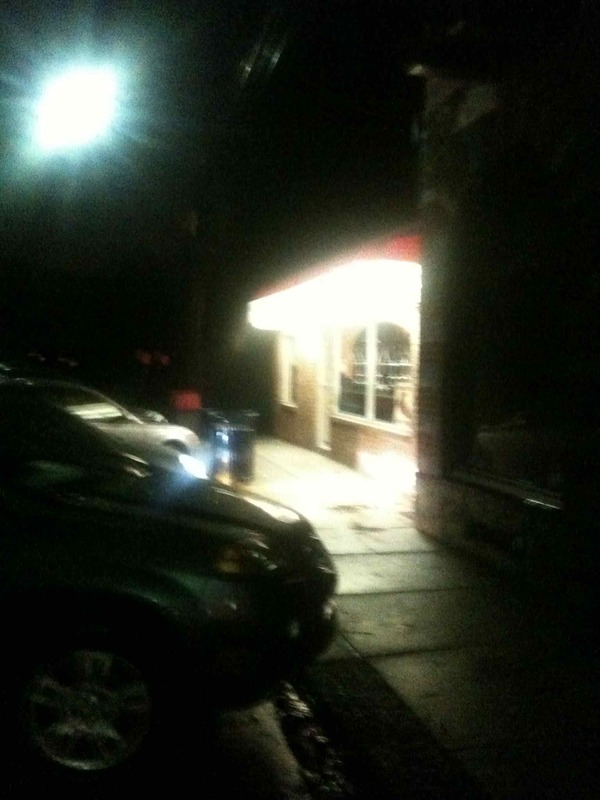 Sciarrino’s Pizza on Brookside Road, Springfield, Pa. remains open at 7:53 p.m., Oct. 29, which is about the time of Sandy’s landfall on the Jersey Shore. 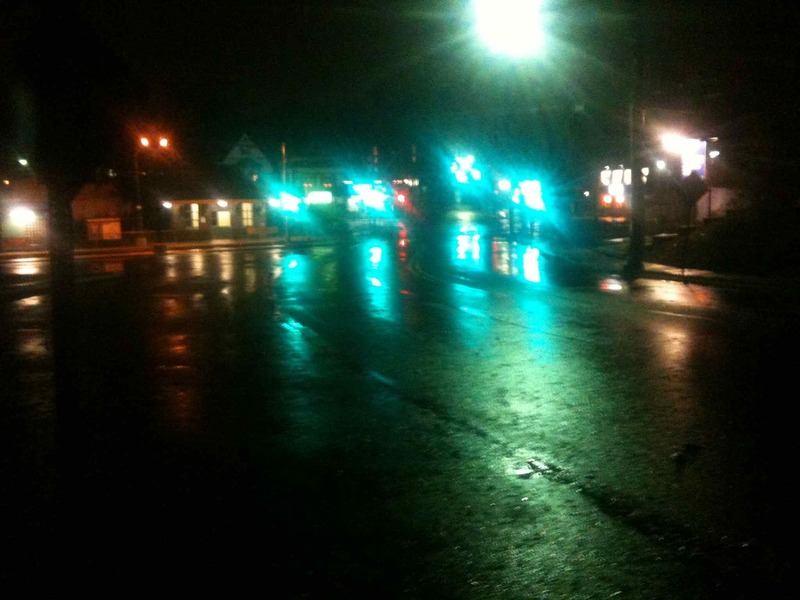 The empty streets of Springfield at 7:55 p.m., Oct. 29 looking south on Springfield Road towards Brookside Road. The rain had stopped but wind had significantly picked up. On the odd side of Windsor Circle one small tree had been blown over and large branches from another had been blown into the street. This spruce fell from the Springfield Township traffic island onto the wall at 18 Windsor Circle blocking island’s southern path along with the northern Windsor Circle entrance. It was photographed at 10:46 p.m. 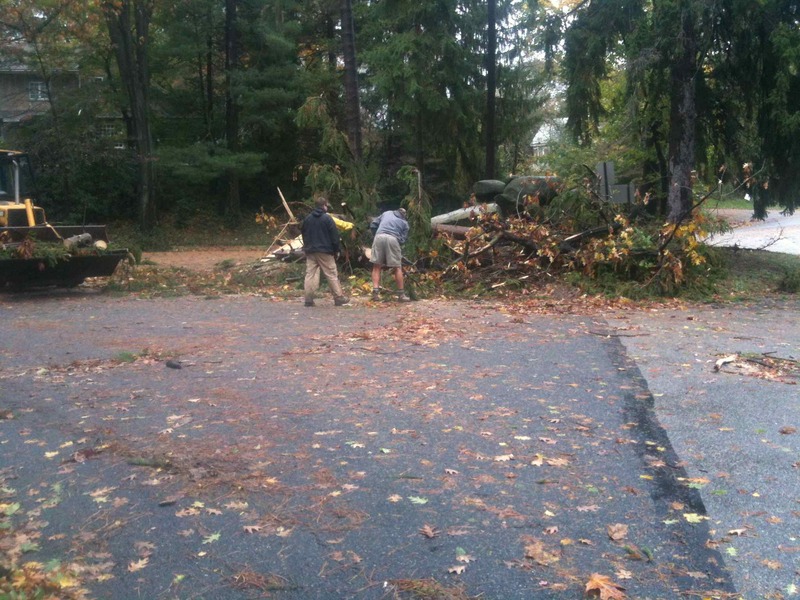 It was the second spruce to fall from the island in three months. 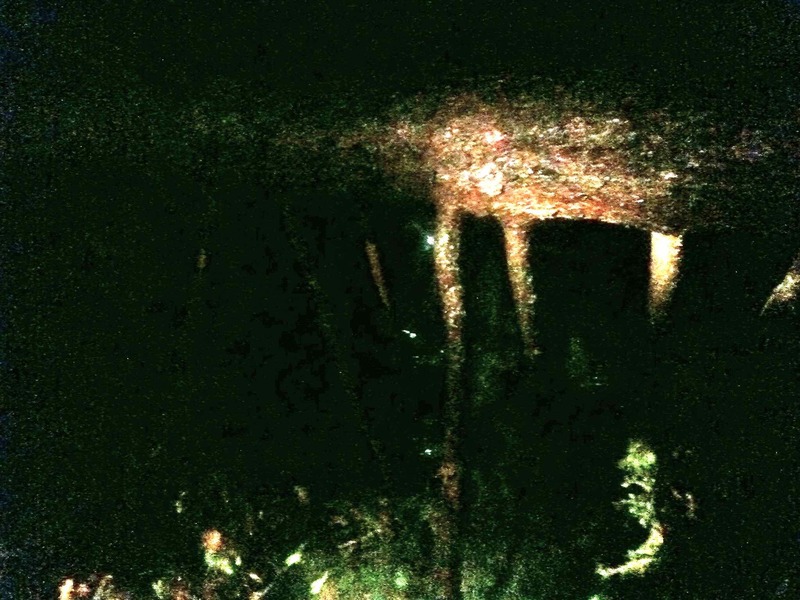 Another blurry nighttime view of the fallen spruce. A far greater amount of damaged occurred across the street when a large tree fell from 33 N. Rolling Road onto the roof of 25 N. Rolling Road. 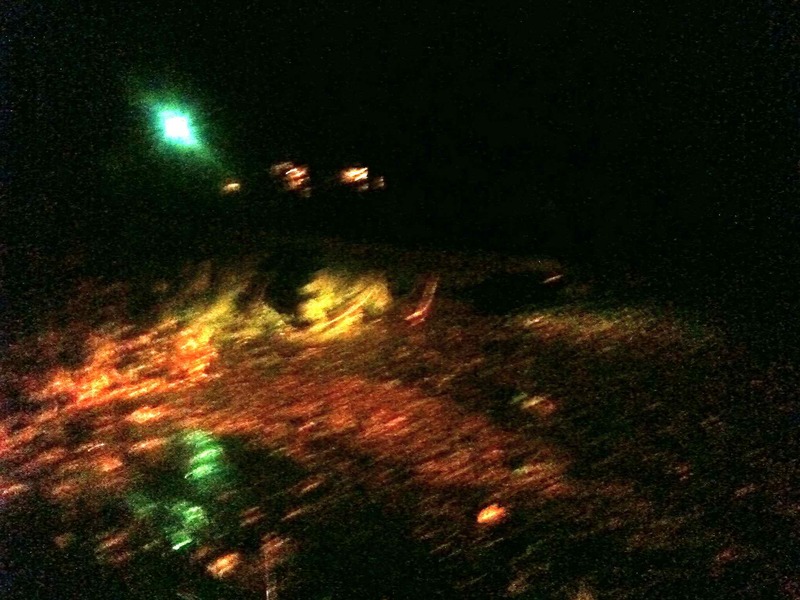 Kudos to the Springfield road crews who were cutting up the spruce at 1:25 a.m. 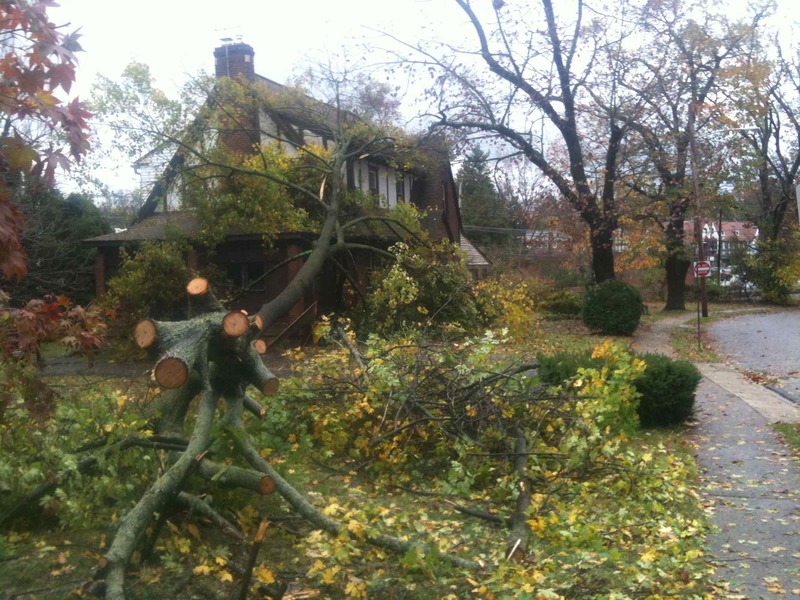 The aftermath: The scene at 33 N. Rolling Road (left) and 25 N. Rolling Road, Springfield, Pa., the morning of Oct. 30. Rain was still falling but the wind had significantly dropped. Another view of the tree that fell on 25 N. Rolling Road. Springfield Township workers remove the fallen spruce tree from the Windsor Circle/Rolling Road traffic island about 2 p.m., Oct. 30. 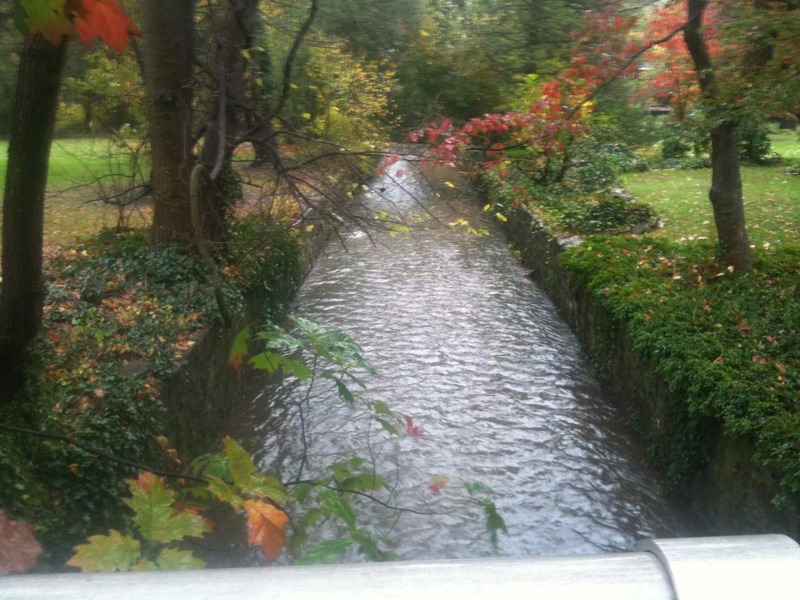 The rain is gone, the high winds are now a light breeze and here is the stream that runs beneath North Rolling Road at 1:48 p.m., Oct. 30.